Chuo Alps or Central Alps (中央アルプス Chūō Arupusu) are a mountain range mostly located in Nagano (prefecture), Japan. There are several hiking routes in the mountains and most of them are suitable for all hikers and require only a little earlier experience. Out of the mountain ranges of Japan Alps, Chuo Alps is definitely the easiest and a good place to start. Most of the action is concentrated around the Komagatake ropeway. A big part of the people here come only to see the views from Sensojiki ropeway station and then head back down. Some climb to the peak of Kiso-Komagatake, and most of the time the traffic drops dramatically if you walk a couple of kilometers away from the station. Komagane, quiet city of about 30,000 inhabitants, is the number one starting place for Chuo Alps hikes. It features frequent connections to Tokyo with a highway bus and resides also on the JR Iida line, if you wish to take a train. Note that the road up from Komagane-kogen to Shirabidaira is permitted only for buses. There are also various other options for starting your hike. For example, you could approach the mountain range from west. There's a hiking trail starting directly from Kuramoto station and it continues west directly up to Utsugidake. The hike from the station up to Kisodono hut is a long one, but doable in one day, if you start early. All following itineraries assume that you will overnight in mountain huts, so no sleeping bag or tent is required. If you are not hiking during the main hiking season (July-August), you are advised to check if the huts are open. Start the route around noon and catch a bus to the Shirabidaira ropeway station. Ropeway whisks you up to 2612m in only 7 minutes. Take the steep route up to Hoken hut and leave your gear either at Hoken hut or Tengu hut. 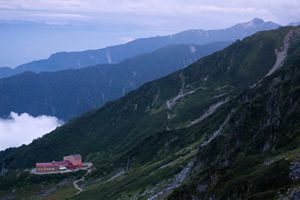 Climb to Kiso-Komagatake and conquer the highest peak of Chuo Alps. Return to the hut for the night. Start your day early in the morning and descend back to the ropeway station just to climb back up to the ridge. Leave your backpack at Gokuraku daira and climb Hokendake. Alternatively when leaving the hut in the morning you can climb Hokendake directly and descend directly to Gokuraku daira. Hokendake is a really rocky peak, and thus easier to climb without your backpack. From Gokuraku daira to Kisodono hut the route is rather easy to walk and the views are truly breathtaking. You can see the valleys on both sides of the mountain range. Overnight in Kisodono hut. Utsugidake is a rocky climb from the hut, but the views are again rewarding. Head south to Minami-Komagatake to conquer your second Komagatake. Backtrack to the hut near the top of Utsugidake and rest for the night. There's still a long trek back down. The route dives into lush forest, when you descend almost 2 kilometers in one day. Finally you will emerge out of the woods near Komagane youth hostel in Komagane Kogen. Similar route as the previous one, but instead of turning south from Utsugidake, skip Minami-Komagatake and keep heading east towards Komagane Kogen. Start early in the morning and catch a bus for the first ropeway of the morning (leaves 8am). Climb up to Gokuraku daira, leave you packs there and conquer Hokendake for the only 2,900m peak on this route. Return to your backpack and keep heading south for the rewarding hike towards Kisodono hut. Have a good sleep in the hut and start early in the morning. The hike up to Utsugidake is a tough one, but after that the route through the green forest will be easier. After a long hike down, you finally reach the holiday village of Komagane Kogen. Start early in the morning and catch a bus for the first ropeway of the morning (leaves 8am). Head up towards Gokuraku daira, and if you are feeling fit, leave you packs there and conquer Hokendake before returning to your backpack. Skip Hokendake if you're doing the hike in late autumn, as there won't be enough light to complete the whole course. The views on your way towards Hinokiodake are gorgeous. Catch your breath on the top of Hinokiodake before you turn to Hinokio route and continue your way back down. Soon you will enter a lush forest, which engulfs you during your final legs down the hill. When you will reach the road again, your altitude is 1,160 meters - that is, about 1,700 meters down in few hours! If you're continuing to Komagane with a bus, the bus stop is a few hundred meters down the road. This leisurely route includes going both up and down with the ropeway. From the Sensojiki ropeway station hike up to Gokuraku daira, turn towards Hokendake, but instead of going up there, turn left towards Sannosawadake. The hike from Gokuraku daira should be about two hours and the trail goes along the ridge, where you have good view to both sides. Backtrack along the same route. If you have time, you could go via the rocky path to Hokendake and descend down to the ropeway station using another route. The most important thing is to keep enough water in your pack and drink constantly. Especially during the warm and sunny days, dehydration is a real risk. There are several spots where you can get drinking water - they are marked on the hiking maps. You can also fill your water bottles in mountain huts. There are several mountain huts (山小屋 yamagoya) along the route, where you can sleep for the night. Overnight with 2 spartan meals costs about ¥7000. Without meals the price is typically around ¥5000. Hiking in the Chuo Alps is not dangerous and many of the routes are of average difficulty. However, there are certain things that you should keep in mind. It's always better to hike with someone. For example, if you strain your ankle, you will have a friend to take care of you. Although if you are hiking during July or August, there will very likely be other people around as well. Tell someone about your planned route. If you're staying in mountain huts, let the people there know where you are heading next. Be sure that you have the necessary equipment, enough drinking water and a proper map with you. The weather can change very rapidly and it can get really cold and windy up in the mountains, even in summer. Waterproof clothing is advised. It is very unlikely that you will encounter any dangerous animals during the hike - there are several monkeys though, but they tend to avoid close contact with people. 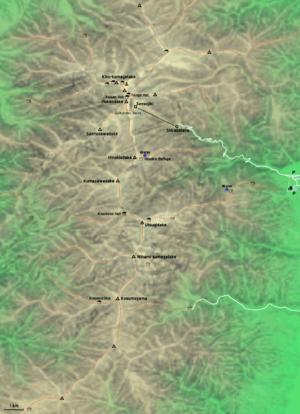 Keep in mind that mobile phone coverage and especially the WCDMA network coverage is restricted in the mountains. This page was last edited on 4 June 2008, at 00:40.